Qin Shi Huang (259 BC – 210 BC) was the founder of the Qin dynasty and was the first emperor of a unified China. He became Zheng, the King of Qin when he was thirteen, then China's first emperor when he was 38 after the Qin had conquered all of the other Warring States and unified all of China in 221 BC. 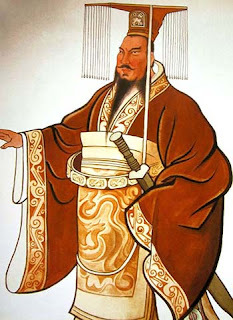 He ruled as First Emperor of the Qin dynasty from 220 to 210 BC. During his reign, his generals greatly expanded the size of the Chinese state: campaigns south of Chu permanently added the Yue lands of Hunan and Guangdong to the Chinese cultural orbit. I have posted on this earlier too……. the culture of statues has a long history and is not new to Tamilnadu alone – and there have been some clashes arising out of issues involving statues, it is another colonial vestige. At important road junctions, at landmark buildings – we have statues of leaders and others lying uncared for in a state of neglect. There are statues in a row in the Marina beach with bird droppings and dirty looks. In the northern State, one CM went berserk installing statues of party symbol and self and the opposition leader appealed to the Centre not to release funds to State fearing that they would create more statues. Originally, statues were installed to propagate the memory of great leaders, poets and visionaries of the Society and even in a place where rationalists question religion, there arose very many statues to leaders of importance. It was to instill in upcoming generations some knowledge and recalling of the glorious acts of the erstwhile leaders. It is unfortunate that instead of learning, sometimes they become the reason for public disturbance. Statues – installing them is another vestige of colonial rule. If statues are symbols – felling them are symbolisms !!!.... ‘Ozymandias’ is a sonnet written by the English romantic poet Percy Bysshe Shelley. In antiquity, Ozymandias was an alternative name for the Egyptian pharaoh Ramesses II. The 7.25-ton fragment of the statue's head and torso had been removed in 1816 from the mortuary temple of Ramesses at Thebes by the Italian adventurer Giovanni Battista Belzoni. Shelley wrote the poem in friendly competition with his friend and fellow poet Horace Smith who also wrote a sonnet on the topic. Both poems explore the fate of history and the ravages of time—that all prominent men and the empires they build are impermanent and their legacies fated to decay and oblivion. 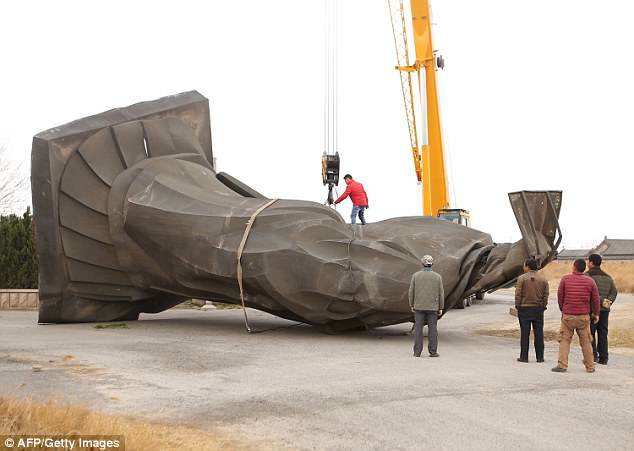 MailOnline reports that the acclaimed world's largest statue of China's first emperor toppled as a strong gale-force wind hit east China last Friday. The report states that the statue of Qin Shi Huang was detached from the pedestal and lifted in mid-air before hitting the floor some 33 feet away head first. There were no injuries reported in the incident. Web users hinted the incident could be an advice to President Xi on his recent decision to rule for life. 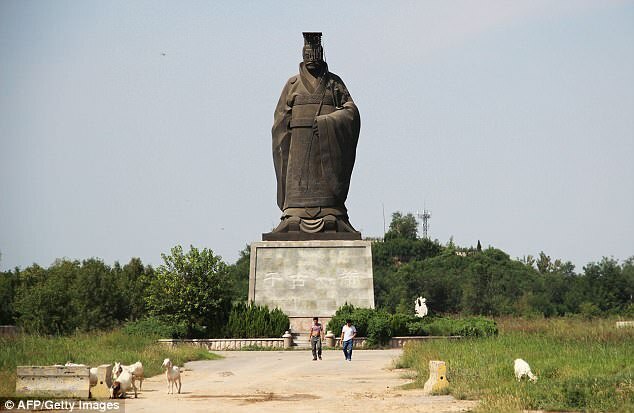 According to Central Chinese Television, the 62-foot-tall statue of Emperor Qin, also known as the First Emperor of China, collapsed at Qin Shi Huang Scenic Park in Binzhou, Shandong Province on April 6. The 'world's largest' Emperor Qin statue, weighs six tonnes, fell to the ground head first and the copper beads from the headpiece scattered around. The massive statue was hit with gusts reaching 46 miles per hour, of level 8 on Beaufort scale, stated in the report. The statue was erected 13 years ago as the scenic park opened in September 26, 2005. Staff members called a forklift and a crane truck to remove the statue in the afternoon. Web users commented on Weibo, China's equivalent of Twitter, that the incident could be a warning to President Xi's recent decision to abolish presidential term limits. 'Perhaps Emperor Qin wants to tell us something about dictatorship!' said one while the other stated that - 'We should learn from our history, right?' However, some of the comments were filtered and not allowed to show online.